Kenya is Africa’s original safari destination,attracting explorers, adventurers and travelers for centuries.Seemingly endless blue skies over-reach red savannahs, where the big five animals roam freely. Arrival of your international flight at the Jomo Kenyatta International Airport. Met by representative outside the customs hall and transfer to your hotel. Rest of the day at leisure. Overnight at the Hotel. After breakfast. 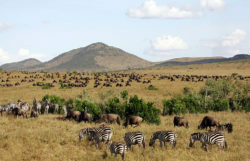 Check-out & drive via Narok to the Maasai Mara National Reserve offering wonderful scenery & plenty of game. Arrive for check in, lunch and relaxation. Afternoon game drive, dinner & overnight at the Hotel. After breakfast, Morning and afternoon game drives or a fullday game drive with packed lunches would take you closer to nature. All meals and overnight at the camp. Breakfast & check out of the lodge. Scenic drive to the Lake Nakuru National Park. 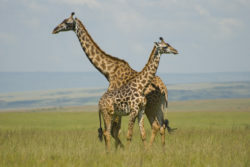 Famous for the alkaline Rift Valley lakes and fantastic bird sanctuary and other wild animals. Arrive for Check-in and lunch. Relaxation, afternoon game drive in the park and around the saline lake. Dinner and overnight at the Hotel. After having the breakfast, drive via Nyahururu to the Aberdares, a beautiful mountain range in the central highlands of Kenya. Lunch at the Aberdares Country Club and transfer to THE ARK LODGE for game observation, dinner and overnight at the Hotel. Breakfast and check out of the lodge. Transfer to the base hotel to meet your driver guide and continue your safari. Leisurely drive to Nanyuki. Arrive and check-in at the club; Day at leisure. The club offers a wide range of optional activities to choose from such as horse-riding, golf, etc. All meals & overnight at the Hotel. Early morning game drive, breakfast and depart for Nairobi. Lunch at the ‘Haandi’ (vegetarian) restaurant or similar. Transfer to the airport for your Flight. International and/or domestic flights and airport taxes. Visas. Porterage, tipping & gratuities to staff & guides. Drinks, laundry, telephones & all other personal extras. Any sightseeing not mentioned in the Itinerary. International travel and medical insurance. All sights & Entrance fees not mentioned, Tips, Items of a Personal Nature i.e. gratuities, laundry, drinks etc. Package valid till 31ST DECEMBER 2016. High Season Surcharges Applicable during Christmas Eve & New Year’s Eve. 1 USD = 66.87. The prevailing Rate of Exchange of the day of payment will be applicable. Children under the age of 7 years are not allowed in The Ark Lodge. Child rates apply for Child U/12 yrs. of age sharing room with parents. The wildebeest migration in the Masai Mara is quite rightly proclaimed one of the animal kingdom’s most impressive phenomena witnessed here.It has a flawless coastline, with its palm-fringed beaches. The capital and the commercial center is Nairobi. Other major centers are Mombasa – An old trading Port, Nakuru – an important agricultural center, and Kisumu – a port on the shores of Lake Victoria. Kenya is an enchanting country and few places in the world can better its varied holiday attractions.